Signed by photographer, Baron Wolman, and Woodstock creator, Michael Lang. Poster features cover image of Woodstock book. Baron Wolman was Rolling Stone magazine’s first photographer. He went on to capture the 1960s pop rock explosion with artists like Janis Joplin, the Rolling Stones, the Who, Jimi Hendrix, Pink Floyd, and Bob Dylan amongst many more. In 1969, Wolman attended what would become the most famous music festival of all time. He captured the experience and atmosphere of Woodstock like no other. More interested in the crowd than the performers, Wolman’s acclaimed photographs are hugely evocative and offer an insight into this legendary event that is rarely seen. 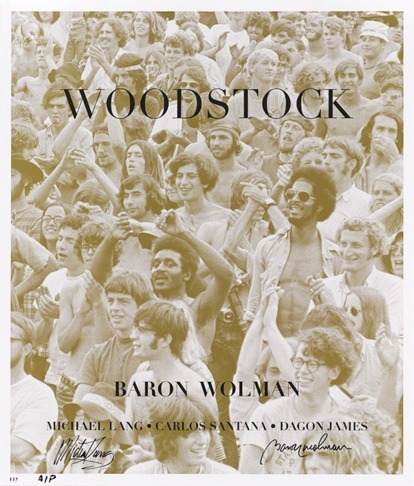 This numbered, signed poster is a limited edition of 100 and features one of Wolman’s most captivating crowd shots, expressing the spirit of half a million people, united in a message of peace, love, openness and cultural expression. This limited edition print of 100 has been produced following the acclaimed release of Reel Art Press’s coffee table volume, Woodstock. The poster features the book’s cover image in a large 32 x 27 inch format, with a gold finish. It is signed by Baron Wolman, and Woodstock co-creator, Michael Lang.